We’ve seen tremendous advancements in the country in the past decades. The massive buildings and facilities constructed here and there signify our economic revolution. But does this progress reach each citizen of Cambodia? 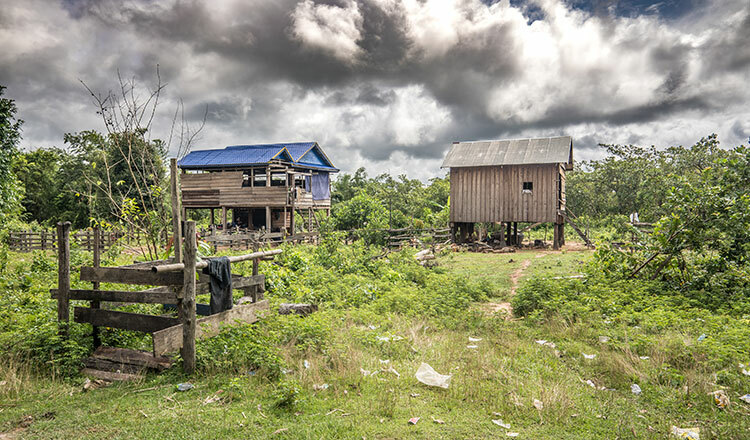 Jean-Francois Perigois travelled to Preah Vihear recently and discovered that economic development in Cambodia isn’t as all-inclusive as it should be. Preah Vihear in northern Cambodia is home to more than 170,000 people. With about 13,800 kilometers of land area, it is considered as one of the nation’s largest provinces. It prides itself on having the Prasat Preah Vihear – one of the most spectacular temples built during the six-century long Khmer empire – in its territory. But, truth be told, the glory of Preah Vihear ends there. The province lags far behind Phnom Penh and Sihnoukville in terms of economic and social development. 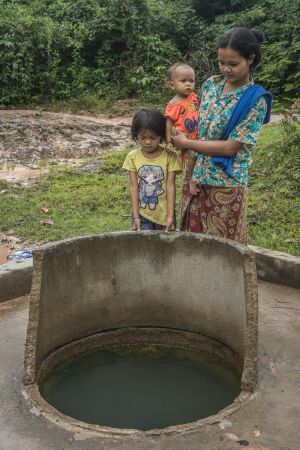 While the two cities boast myriad of modern edifices and booming industries and tourism, Preah Vihear consists of small villages that do not even have access to clean water. Children are undernourished and ill, but health clinics are almost never present at all. 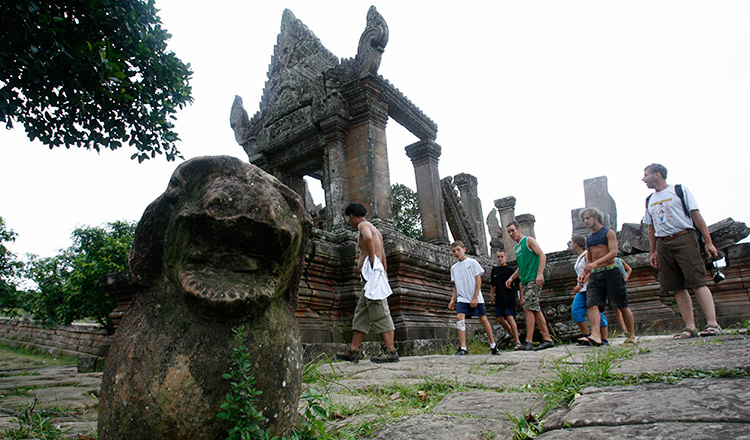 Compared to other big cities and provinces, Preah Vihear runs at a slow pace towards real progress. Same country, another world, that is. Sorn (in black blouse) meeting with Action Against Hunger field staff. 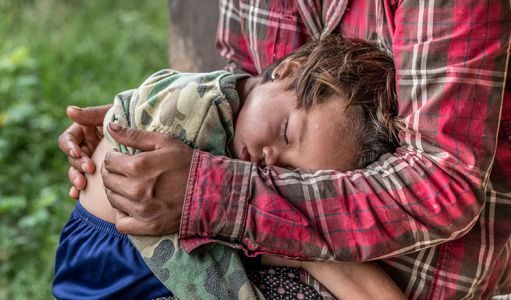 It’s supposed “hope of the future”, the children, are growing up in unhealthy ways – no nutritious food on their plates, no safe drinking water, no clean toilets or bathrooms. They become malnourished and sick, and their learning abilities get curtailed. Not only do they suffer physically, their future is at stake. In the village of Krala Preas, about 30 kilometers from Tbeng Meanchey, I met a few people who are in an unfortunate situation. 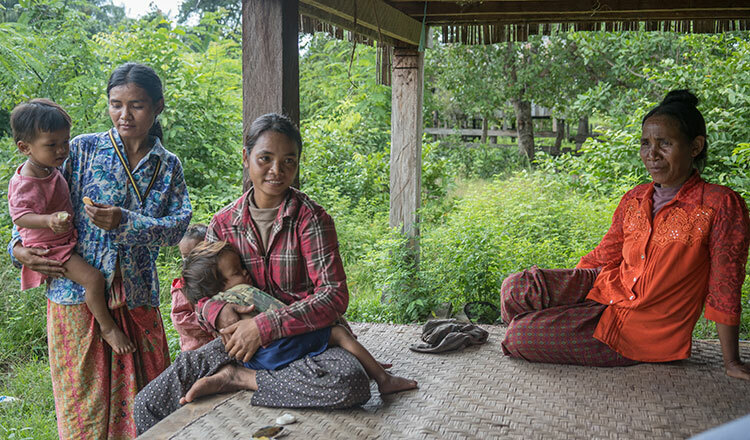 Hun Sorn, a mother of a one-month old child, lives in a small wooden house behind her parents’ home. After she was abandoned by her husband, she has to rely on vegetables she grows beside her house and on some salt and fish paste for her daily meals. Her nutrition, of course, affects the health of her child. Sorn’s baby was born in the provincial hospital and weighed 2 kilograms. Sorn attended antenatal care four times and the doctor said “all was okay with the baby”. She was given a yellow card for her child, but she does not know how to use the growth monitoring table nor has any idea what the card is for. It was a meeting with the global humanitarian group, Action Against Hunger, that she was taught the importance of healthy diet and hygiene for her and her child. A few meters from Sorn’s house is an open well that only swells with water during the rainy season. On the dry months, villagers collect water from a distant village. But such water source doesn’t ensure safety and cleanliness as well.Sokurn, an 18-year-old mother of an 11-month boy, shares the same story. Her small family lives near a rice field, which gets flooded half of the year. While they wait for water to subside and harvest their crops, her family gets fish from a stream in another village. She said that living in a remote village makes poverty more evident as there are no ways for people to store food or get a stable source of food supply. To make things worse, harvests do not usually abound. Last year, the villagers had to endure a three-month long rice shortage. The forest, which they run to for food and other resources, has slowly vanished as more and more people settled in the area. Now, villagers cut trees and sell them to neighbouring areas. “If I don’t cut [the trees] myself, someone else will,” said Sokurn. Fruit-bearing plants, vegetables and animals, which they used to source from the forest, can no longer be seen. Resin trees have been cut down by a “company”, and the affected families received no compensation. There is no market nearby and the availability of food is low and rare, especially for meat and vegetables. Across a muddy track, another family lives in the same unsuitable standard. 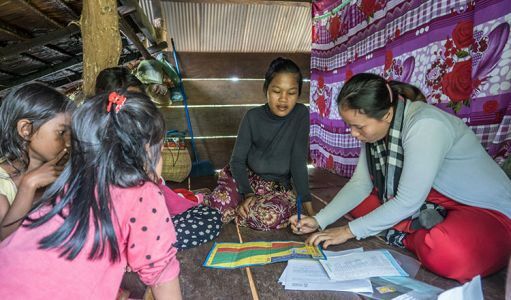 Som Ean, 25, takes care of her four-year-old son and three-year-old daughter. She spends four to five months in the rice fields – a one-hour walk and boat ride from her home. This year, the rice harvest ran short. To feed the family, she works on a cassava farm while her husband cuts wood for income. Both of their children are underweight and have all the symptoms of malnutrition. Their son also suffers from skin disease. Ean visited the provincial hospital several times, spending $25 to $50 each time, but she got no cure for her son. She narrated that during her pregnancy, she got some advice from Action Against Hunger on how to prepare a good meal for her children. She wants to follow the instructions religiously, but she can barely afford vegetables and meat. She is severely affected by poverty, she said, that she can’t buy basic necessities for her and her kids. Even with her recently claimed ID card for the poor, the future of her children in terms of health is still too blurry.